All the figurines are carefully produced in 1:21 scale, and cast in a specially formulated metallic resin before being painted by hand and individually numbered. The specially formulated resin and high quality sculpting allow the figurines to reproduce an incredible level of detail right down to the mesh in the Silurian Warrior’s uniform and the controls on Davros’s console. Mine have arrived at last…hurray!! Me too. When I thought about, if all the subscribers got theirs first, and the shops got the Cyberman figure nearly two weeks (as we did), it would have next to no time to sell in its allocated slot before it was pulled for the next figure. So I can understand why some of us are sometimes compromised a little. However, rather than us having what is clearly a week long or more of disappointment. A little courtesy email from Eaglemoss would help and then perhaps we would all be happy as I can understand that Eaglemoss will not always have all stock on day 1 for subscribers and shops alike. Thanks for keeping in touch about your parcel situation; in the absence of emails from Eaglemoss, it is the next best thing. Spoke to Eaglemoss this afternoon, they told me more issues 98 and 99 had been despatched and should reach subscribers in the next 2-3 days. I week on after some people received theirs, anyone else not received these two yet? Wondering if there are delays; perhaps too soon to contact them after 1 week. Nor mine. From the email they sent, it says it takes 10-15 days from dispatch, so if you were payed on the Thursday 2 weeks before, like me then that time was up today, if your one gets charged about 10 days before, then you’ve got until the end of the week before its time to contact them. I hope the rumour of them going down the nick is false… At this rate the public will be able to get both figurines from Asda before the subscribers get them ! No, nor me. I think it quite unusual for there to be 2-3 of us, and that is just the ones that are commenting or looking at the site. Mine are also still not here today. I’m wondering whether they didn’t have enough to send, but took all the money anyway, and we have to wait for them to be back in stock. They should have a figurine of the Ice Warriors from their first appearance in 1967 with the Second Doctor and the remaining Master’s after issue 100 of Anthony Ainley, Eric Roberts, Derrick Jacobi and Michelle Gomez as tribute to her departure with The Twelfth Doctor. Those remaining ones would look good with all the Doctor incarnation figurines. Aren’t they planning to do the rest of the Masters booboo? You know what they should do? A Drashig (As a special obviously). Got this yesterday, a good figure but it could have been done as a subscriber exclusive rather than the main line. 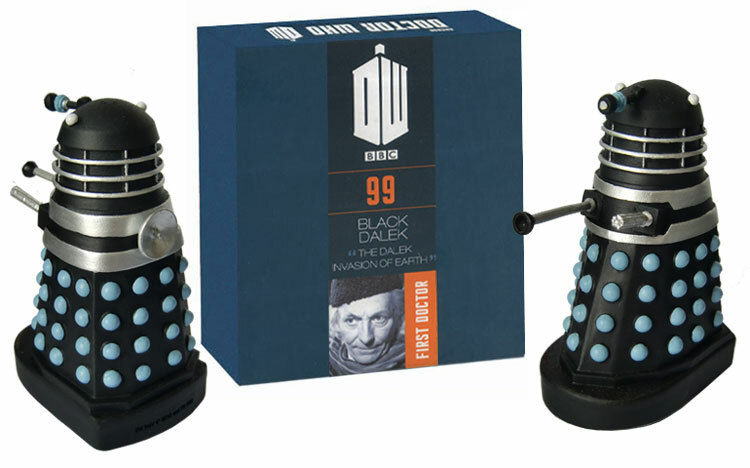 Just wondering if anyone else is still waiting for the latest figurines, 98 and 99, as I have not yet received mine and have read that the place which sends them out has gone bust? A little concerned as I usually receive mine the same time as other people. Thanks for any information. And if you get in touch with them do it via Facebook, they’re far more responsive. Mine have also not turned up yet, I’m not sure whether it has anything to do with the fact that a replacement for Issue 97 is meant to be sent with 98 and 99 or whether, as you yourself worry, whether it has been forgotten. I got mine on Monday past, no delay at all. Concern over, the figures have arrived today:) Thanks for the replies. I’m not the only one that received 2 copies of ‘The Veil’ magazine and no destroyer mag then? No, Philip, you’re not the only one, I did too, and I think other people did too. I think whoever packed them may have had upside down copies of 96 mixed into the 97 pile. Hopefully it will be sorted soon. I still have not had mine. Usually get mine 1 day after BooBoo posts. I usually get mine the same day as booboo posts or the day before sometimes, but I’ve still not had mine yet either, starting to get worried, but thanks to the emails, one has to wait 15 working days from date of email till one can request it to be resent. Hopefully won’t come to that. Lovely, you can never have too many Daleks. Does anyone know when the Destroyer will be available on eaglemoss website again. They not available in any of my local stores and I am having to get them off the site.